Layken's mother gets a job which leads to an unwanted move across the country. However, a new home means new neighbours... and Layken's new neighbour is the very attractive Will Cooper. Will has an intriguing passion for slam poetry, and a matching passion for life. The two feel an irresistible attraction but are rocked to the core when a shocking revelation brings their romance to a screeching halt. Layken and Will must find a way to fight the forces that threaten to tear them apart...or learn to live without each other. My Summary: Layken has not had an easy year. First her father died, and then her mother suddenly announced that they were moving to Michigan, leaving behind the house Layken grew up in. Still, she forced herself to be strong through it all and never complained, knowing how important it was to her mother and little brother to be able to move on. My Thoughts: I'd been seeing so much buzz about this one all over my social media, so I knew I had to give it a try. 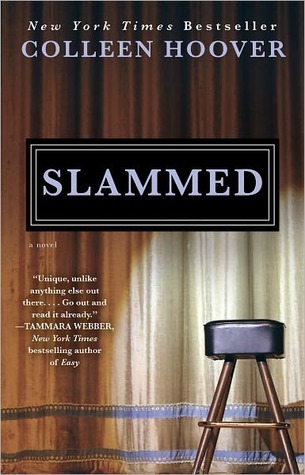 Slammed was one of those incredibly addictive novels that you can't put down for more than a few minutes, even if it isn't perfect. Despite a few flaws I found Slammed to be an incredibly fun read, and I felt myself rooting for the characters the whole way through. Will and Layken were endearing. I loved them together, even though I'm not usually a big fan of insta-love. The plot moved along smoothly and the writing was easy to follow. I also really enjoyed the poetry aspect of the novel - as a fan of slam poetry, it was refreshing to read a book where it was woven into the plot. Final Thoughts: I recommend this novel to anyone who enjoys edgier contemporary YA and romance.